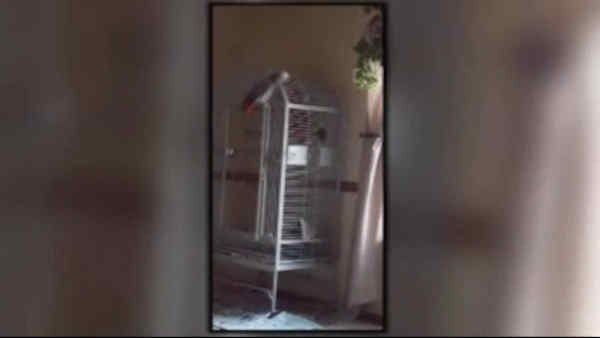 Could parrot be witness in Michigan murder case? GRAND RAPIDS, Michigan (WABC) -- A murder case in Michigan has taken a bizarre and disturbing twist after the victim's parrot, Bud, was recorded repeating words that the man's family believes it heard just before their son was shot dead. Martin Duram, 45, was shot and killed in his home on in Sand Lake in May 2015. His wife was also shot but survived, and she is now a suspect. "That bird picks up everything and anything," the victim's mother, Lillian Duram, said. "And it's got the filthiest mouth around." The bird, they say, mimicked both Martin Durham and his wife, Glenna, in video recorded several weeks after the shooting. It starts what sounds like an argument, with the bird changing voices. Eventually, Bud says, "Don't (expletive) shoot." "Then, all of a sudden, this came out of the bird's mouth," dad Charles Duram said. "I personally think he was there and he remembers it, and he was saying it." Police reports show that a witness asked police whether they could use the bird as evidence, but they don't show that the detective responded. Newaygo County prosecutor Robert Springstead says he's aware the couple had a bird that talked but said he had not seen the video. Doreen Plotkowski, the owner of Casa la Parrot in Grand Rapids, weighed in. "It's definitely an argument between a man and a woman," she said, adding that it's not unusual for African grey parrots to mimic male and female voices. "In my mind, it's something that he's heard, definitely heard before." State police identified the wife as a suspect in a murder-attempted suicide, suggesting she shot him five times before turning the gun on herself. They say she left three suicide notes. and that the gun belonged to the family. But in an interview with police after she recovered, she denied killing him, saying she remembered nothing until she was in the hospital. The prosecutor said he plans to make a decision on charges in two to three weeks.